About a year ago, I was experiencing some strange health issues. I felt sluggish, my digestive system was not happy, and the constant thump-THUMP-thumping heart palpitations were unnerving to say the least. So, after ruling out any dangerous cardiac conditions, I went to see a naturopath for the first time. When she suggested I remove dairy from my diet to see if it made a difference, I admit I had a hard time believing that dairy could be the culprit. But I was willing to try anything. Studies show that 60% of adults have some level of lactose intolerance, so maybe it wasn’t that far-fetched after all. At first, remarkably, I was fine with eliminating dairy. I just wanted to feel better. But then, the reality of a dairy-free diet set in. The stuff is in everything! Especially delicious things! Worst of all was giving up cheese. This girl really loves her cheese. And as a vegetarian, I must say that cutting the dairy from my diet has been far more difficult than giving up meat ever was. Ultimately, though, it’s a small sacrifice for my health. And the fact is, even though two sweeping categories of food – meat and dairy – are no longer a part of my diet, the food options are still vast. Infinite, really. But, man. There are times when nothing compares to a big, cheesy plate of amazingness. Lasagna, macaroni and cheese, pizza, frickin’ grilled cheese. Whimper. So here’s how I manage to live a life without cheese. First, I’ll talk about some lactose-free (vegan) cheese options, then I’ll list some of my favorite cheesy foods along with alternative ideas. I’ve also linked more than 50 recipes – all dairy-free, all delicious! 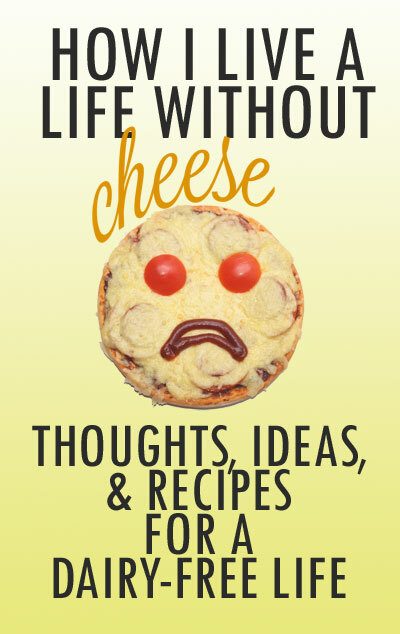 If you, too, are facing a life without cheese, I hope you’ll find it useful. If I’d known about nut parmesan (also known as “fairy dust”) before going dairy-free, I still would have consumed it with delight. In a, um, nutshell, cashews or almonds are finely ground then mixed with nutritional yeast flakes, salt, and perhaps a little garlic powder. The result is remarkably reminiscent of actual grated Parmesan cheese and is oh-so delicious on pasta dishes, soups, and especially sprinkled over popcorn. With a little ingenuity, remarkably creamy and cheesy sauces can be made with a handful of miracle veggies – namely, cauliflower, sweet potatoes, or butternut squash. Usually, nutritional yeast is added as well. Yes, “nooch” is somewhat of a strange ingredient, but make the leap! It’s worth it (plus it’s an incredible source of vitamin B-12). I have not tried eggplant-based cheese (WHAT!) but I’m also pretty intrigued by this Cashew-Less Vegan Queso from Minimalist Baker. I’ve started making two different kinds of “cheese” – ricotta and feta – from tofu, and I’m continually surprised by how close it tastes to real cheese! Tofu ricotta, especially, takes on the exact creamy consistency of actual ricotta – it’s really kind of uncanny. Plus, like dairy cheese, it’s a great source of protein! Although I haven’t yet tried making cashew cheese myself, it’s such a popular option overall that I would be remiss to leave that option out. From milks to coffee creamers to creamy sauces and the above-mentioned Parmesan, raw cashews are the most amazing ingredient for a dairy-free diet, bar none. As if it wasn’t amazing enough already, you can also make cheese with it! For me, it’s not as simple as simply swapping out actual real dairy cheese with store-bought vegan cheese. Because 1) I try to eat very little processed food and 2) well, it’s … just not the same! The best brand I’ve found is Daiya, which, thankfully, is pretty widely available. I’ve tried most of their products, and I like (and can recommend) two of them. Trader Joe’s also makes a soy mozzarella that shreds and melts almost like the real stuff, though it’s pretty light in flavor. We have pizza every Friday night, and on the rare occasion, I’ll top mine with Daiya mozzarella-style shreds. It “melts and stretches” as their package proclaims, and reminds me enough of my mozzarella days that I consider it a treat. I also like Daiya’s provolone-style slices for grilled cheese if I really have a hankering. Frankly – and this is not to knock any vegan cheeses, because I am glad they exist – the key to enjoying them is low expectations. Don’t expect the ooey gooeyness of your past cheese-filled life. But they fit the bill in a pinch. Okay, so here are some of the classically cheesy foods we all know and love, along with some of the cheese-free alternatives I’ve been enjoying. We have pizza every Friday night. So health-wise, it’s perhaps a good thing that I had to nix the cheese! I’ve tried vegan pizza many ways over the past year, and I have to say, a pizza without cheese isn’t really as depressing as it sounds! I’ve found that you either need to have 1) some element of creamy (to make up for the creaminess the cheese would have contributed, like a creamy sauce or flavorful pesto), or 2) add a little vegan cheese to the mix – either nut parm or store-bought. Otherwise, good ingredients like an amazing homemade crust and a terrific sauce go a long way. 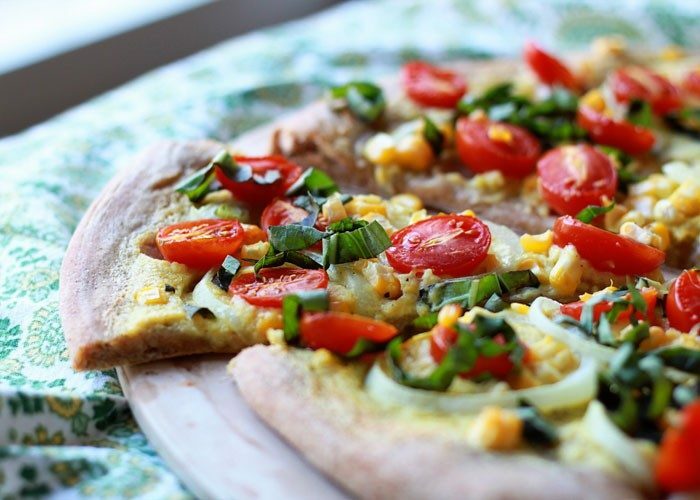 Vegan Summer Pizza with Sweet Corn, Tomatoes, and Basil – The creamy sauce made with pureed coconut milk, garlic, and corn totally makes this pizza. So good. Vegan White Pizza with Roasted Garlic Coconut Cream & Sun-Dried Tomatoes from Sweet Beet & Green Bean – That transcendent roasted garlic and coconut milk sauce and the pop of sun-dried tomatoes? Yum. My Favorite Vegan Pizza from Minimalist Baker – Dana sautes the veggies before baking her pizza and swears by it. I’ve tried it – it definitely makes for a tasty pizza! A dusting of cashew parm completes the picture. Deep-Dish Vegan Pepperoni Pizza from Namely Marley – that homemade pizza crust, vegan pepperoni, some vegan cheese shreds and nut parm … if you’re really missing traditional pizza, carnivore style, this decadent affair should do you nicely. Florentine Dairy-Free Pizza from BBC Good Food – if you’re a meat-eater removing the dairy from your diet, this delicious-looking pizza has plenty of options for you. I waxed poetic about how much I love macaroni and cheese in this post, which is also one of the most popular recipes ever on Kitchen Treaty. But, hey, going cheese-free is an opportunity to be creative in the kitchen, right? Oh, who am I kidding. I miss mac and cheese. But there are a few options that come surprisingly close to the real thing. Many of them involve some sort of vegetable-based cheese sauce, and they’re remarkably creamy and delicious. 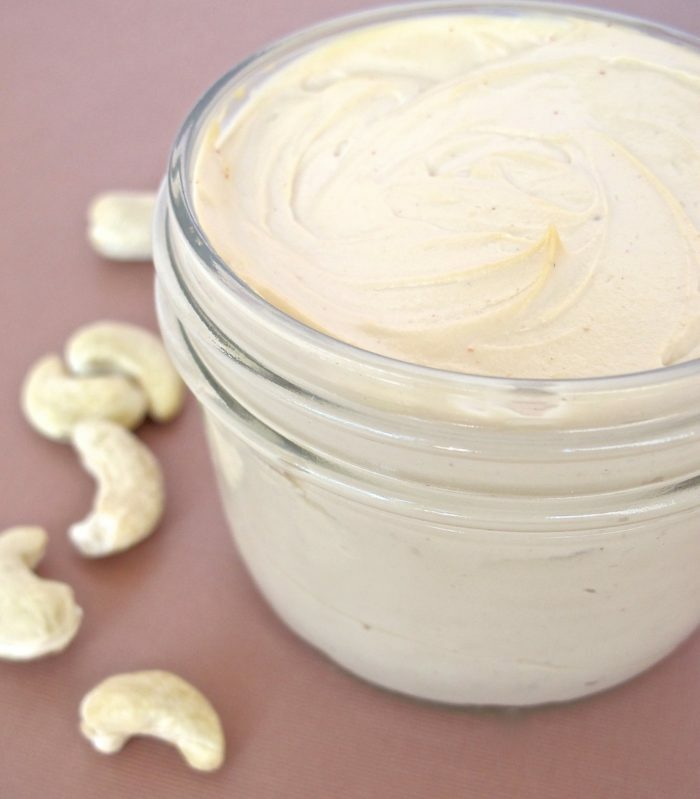 There are also options out there that utilize cashews or store-bought vegan cheese products. Creamy Stovetop Vegan Mac & Cheese – This mac & cheese uses sweet potatoes, butternut squash, and no nutritional yeast if you’re not quite ready to try it or (what happens to me often) you’ve run out. I love this stuff! Dairy-Free Mac & Cheese from Fork & Beans – Another veggie based version, this one uses cauliflower and butternut squash. I love the cauliflower especially – it gets so silky and creamy smooth when pureed. Grown-Up Dairy-Free Mac & Cheese from Go Dairy Free – this version replicates the roux-and-cheese base that is the heart of most classic mac and cheese recipes. It uses almond milk and store-bought vegan cheese and though I haven’t tried this one yet, it looks remarkably good! The Best Vegan Mac & Cheese from Detoxinista – cashews make this creamy version happen. Chipotle Mac & Cheese with Roasted Brussels Sprouts from The Post Punk Kitchen – another cashew-based dream. Vegan Mac & Cheese with Butternut Squash Noodles from Food, Faith, Fitness – Creamy butternut squash noodles with a creamy, cheesy cashew-based sauce. Yum. Creamy One-Pot Pumpkin Pasta – This is not a mac & cheese recipe, but that creamy, tasty sauce is sure reminiscent of many of the qualities of classic mac. I encourage you to give the dairy-free version a try! This recipe for White Pizza Grilled Cheese went viral in Kitchen Treaty’s early days, and trust me, this decadently cheesy sandwich – and grilled cheese sandwiches in general – are one of my favorite foodstuff. Ever. And I hate to say it, but I’ve really not been able to come close to replicating a good grilled cheese sandwich. Occasionally, I’ll make grilled cheese sandwiches for the family and for mine, I’ll use either olive oil or vegan butter along with a slice of vegan provolone cheese from Daiya. It works. I’ve also used hummus in lieu of cheese or cheese substitutes altogether. I haven’t quite perfected that one, but it’s passable. Grilled Cheese Sandwiches from Vegan Yumminess – That vegetable-based cheese sauce looks ooey-gooey-melty perfect. Vegan Grilled Cheese with Caramelized Onions from My Whole Food Life – A “cheesy” cashew-based sauce along with a smattering of veggies make this sandwich a contender for sure. Tangy Cheese Sauce on a Beastly Pretzel Slider from Spa Bettie – Not a classic grilled cheese per se, but dang if this cheese-and-bread combo doesn’t look insanely good. There are a few ways to go about dairy-free lasagna. First, you can just swap out the cheeses with store-bought vegan cheeses. Done. You can also create a tofu ricotta that tastes much like the real thing – it’s uncanny and delicious in lasagnas. Another great ricotta sub can be made with cashews. Or perhaps a bechamel-like cashew cream? Seriously, is there anything cashews can’t do?! Finish up with a sprinkle of nut parmesan and deliciousness ensues. 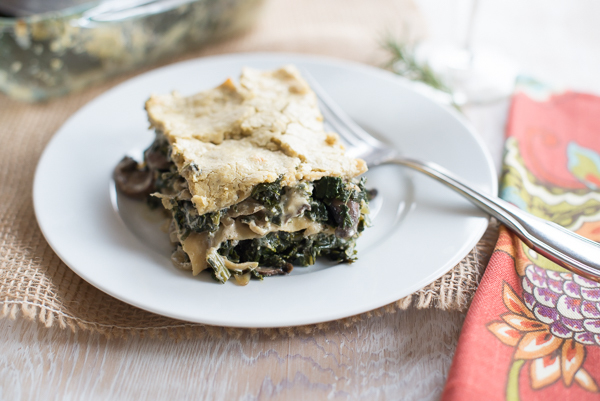 Creamy Mushroom and Kale Vegan Lasagna from Oh My Veggies – A creamy rosemary cashew sauce takes this over the top. Vegan Lasagna with Lemon Basil Cashew Cheeze from Oh She Glows – This incredibly decadent-looking version makes use of a lemon basil cashew “ricotta” along with store-bought shreds. Yum! Ultimate Vegan Lasagna from Vegetarian Times – This one uses both tofu ricotta and vegan cream cheese. Vegan Butternut Squash Lasagna with Cashew Cheese & Kale Pesto from Food By Mars – Creamy cashew cheese, pesto, and butternut squash make an extra-healthy lasagna. Quesadillas are another tough one. Again, store-bought shreds are one option. Another way to go about a cheese-free quesadilla? Try inserting some avocados. They add the creaminess that you’re missing – so good. Green Chile Enchilada Quesadillas from Fork & Beans – Avocados, onion, black beans, green-chile sauce, and a homemade grain-free tortilla recipe to go along with it for those who are eating gluten-free. Yes yes. 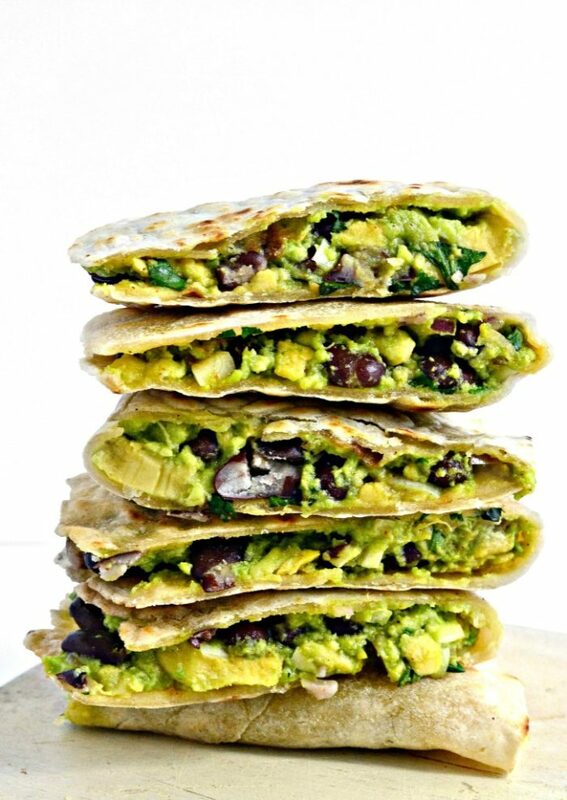 Vegan Avocado Quesadillas from The Garden Grazer – Super simple yet creamy-dreamy good. Quickie Cheeseless Quesadillas from Happy Healthy Life – More avocado plus mashed beans help ensure you’ll never give cheese a second thought. Black Bean Cashew Cheese Quesadillas from Earthgiven Kitchen – Cashew cheese and Daiya shreds both lend cheesy goodness. Cheese dip – one of life’s most divine foodstuffs. This is a tough one to give up. We’ve got a few plant-based alternatives, though. Pureed veggies with lemon juice, garlic, and other flavorings can fit the bill surprisingly well. There are also cashew-based recipes out there, too. Velvet Vegan Cheese Sauce from Namely Marly – This dairy-free queso reminds the author of American cheese, but it has two surprisingly healthy ingredients thrown into the mix, pumpkin and chickpeas! Some store-bought shreds seal the deal in this recipe. Vegan Butternut Queso from The First Mess – A seriously swoon-worthy imitation of the real thing. 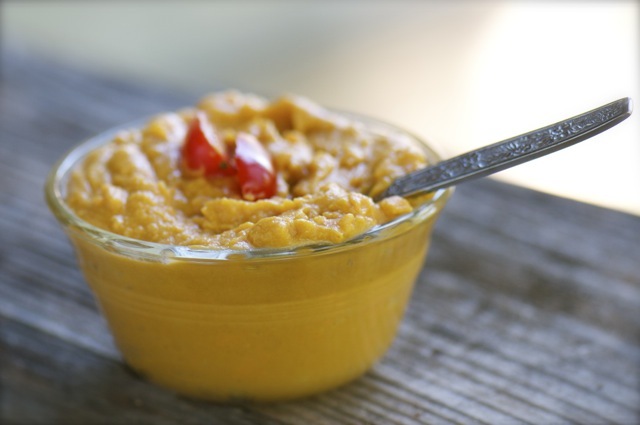 Spicy Chickpea Nacho Cheese Sauce from The Plant-Strong Vegan – Chickpeas and spicy peppers add creaminess and heat, respectively of course, to this creamy dip. 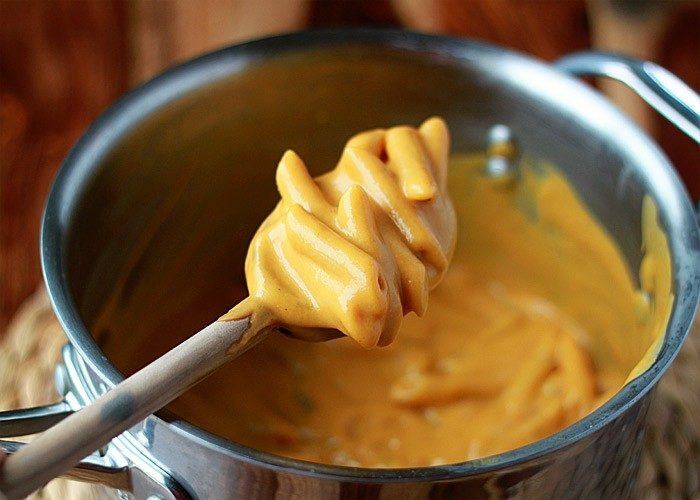 Nacho Sweet Potato Cheese from Connoisseurus Veg – An excellent rendition of nacho cheese, with the color to match the flavor! Cashew Queso from The Post Punk Kitchen – Cashews and miso make a darn tasty combo. Vegan Mexican Cheese 3 Ways from Minimalist Baker – Three different ways to get your queso fix, dairy-free. Can’t beat it. Okay, so pesto isn’t necessarily a “cheesy” food but it usually contains a good dose of Parmesan. I’ve found that either leaving the cheese out completely or adding in a bit of nutritional yeast still yield a glorious pesto. It’s all about the herbs and green + garlic + olive oil anyway! Bestest Pesto from The Post Punk Kitchen – You truly don’t miss the cheese. Dairy-Free Basil Pesto from Overtime Cook – Another great dairy-free pesto option. 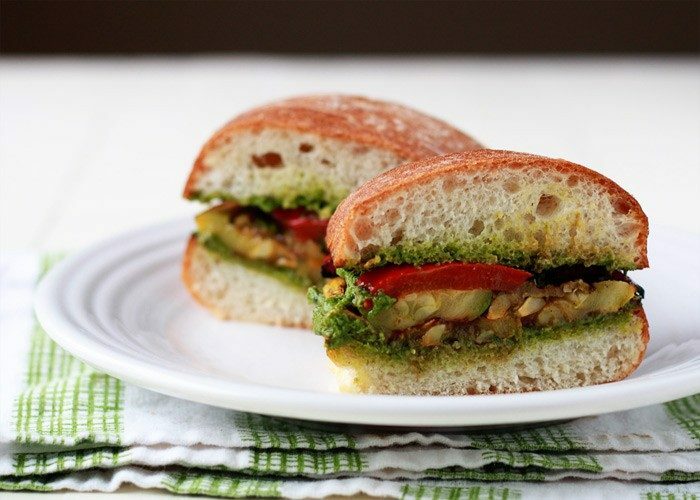 Grilled Summer Vegetable Sandwiches with Pesto – A creamy vegan pesto brings these veggie sandwiches to life. Vegan Pesto Parmesan Breadsticks from Minimalist Baker – We’ve got vegan pesto and vegan parm for these bad boys, and I’m not sure I’d have it any other way. Yup. No dairy = no cream cheese = no cheesecake = waaahhh. Some tasty no-dairy cheesecakes are out there, though. Most make use of either cashews or tofu, and they’re really decadent and delicious! 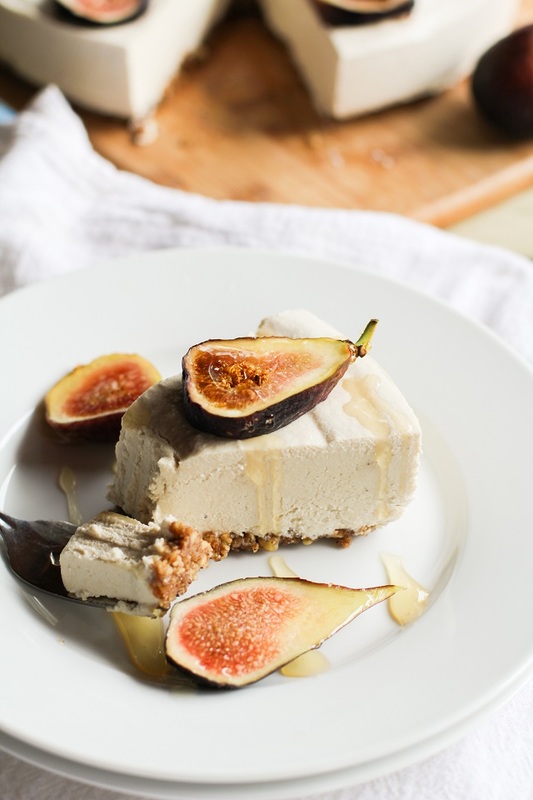 No-Bake Vegan Cheesecake from The Roasted Root – Creamy, dreamy, and cashew-based. And when covered in figs and honey … drool. Raw Blueberry Cheesecak from Go Dairy Free – From the almond-date crust to the creamy cashew filling to the blueberry topping, this one is definitely special-occasion worthy. Dairy-Free Coconut Cheesecake from Jamie Oliver – Cashews + coconut + dates = yes please. Vegan Pumpkin Swirl Cheesecake from Minimalist Baker – Firm silken tofu gives this autumnal cheesecake its creamy lusciousness. See? It might not be so bad to live a life without cheese. Do you have any dairy-free ideas or recipes you’d like to share? Or a favorite cheesy food you’d like to see made dairy-free but is still delicious? Be sure to share or make a request for ideas in the comments below! Now that I’m living dairy-free, I’ve got an ever-growing collection of dairy-free recipes (or recipes with dairy-free options) right here on Kitchen Treaty! Give ’em a look. 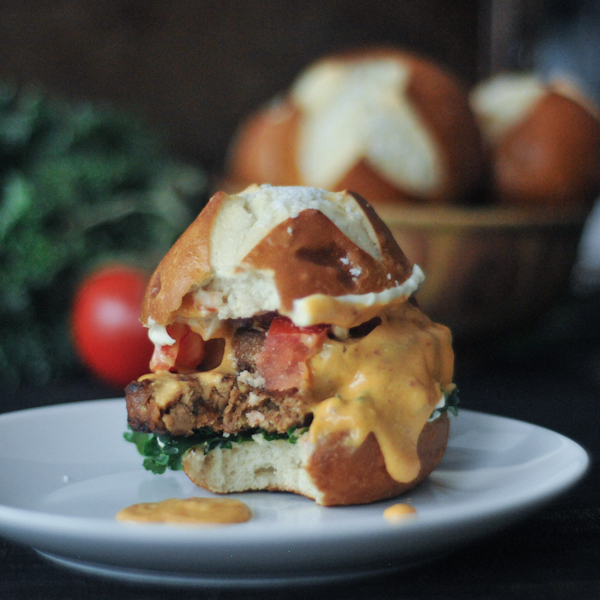 Terrific vegan blog It Doesn’t Taste Like Chicken has about a gazillion dairy alternative ideas in this post and video. Karen this is a masterpiece — what an amazing resource this is! I have not tried Chao slices but now they’re on my list! I *love* Field Roast sausages. Thanks for the tip! This is such a fantastic read and so informative. I just stumbled onto your page after searching for mezze ideas and ended up on this article which has really inspired me! Dairy gives me trouble but I love it too much to avoid it completely, but having recently gone vegetarian as well there are so many ideas for me just in this one article. Thanks so much and I look forward to trawling through the rest of your blog! Hi Bec, thanks so much! Seriously – I feel like going vegetarian was SO much easier than eliminating dairy. Every once in awhile I try it again and bam, issues again. I keep hoping it was just a blip! Still, there are so many other wonderful options out there. Best of luck in your journey! Did you know that you can take medication for lactose intolerance? One pill before breakfast and you’ll be protected whole day. At least my friend with lactose intolerance does that and can eat her beloved cheese! You don’t have to abandon eating cheese just because you are lactose intolerant. Ask about t to your GP! It is surprising how easy it was to completely cut cheese out of my life. I don’t replace it with fake cheeses though because there is really no substitute for the real deal. If I’m craving it, I will eat it in really small amounts. I’m lactose intolerant and I’ve been obsessed with Daiya’s mac n’ cheese from a box lately! It’s sooo creamy and I honestly can’t tell the difference between it and normal, dairy-filled mac n’ cheese (although all my dairy-eating friends disagree). It may be filled with preservatives…but try it out if you’re feeling indulgent. And thanks so much for this awesome resource! Thank you for this great website. You’ve inspired me. We enjoyed some of the vegan “cheesy” recipes in the May All Be Fed book by John Robbins. The Spinach Lasagne recipe was especially good, but I have been eating a lot of dairy cheese and I know it’s time to stop. My body doesn’t like it any more (did it ever?) and the acupuncture physician I want to go to requires his patients to go dairy free. I’m so glad you posted all those links. Thank you again. We tried Daiya because we read so much good about it. The clerk at Whole Foods recommended it too, but we didn’t like it at all – not even my son and he will eat almost anything. I think it was the provolone. Do you have to melt it for the good flavors? I think we just ate it out of the package. I’ve been afraid to try their other styles. Thanks. This article is so so so packed full of great things. I have recently developed a lactose intolerance and I am definitely someone who ate cheese on ANYTHING. I don’t like store bought vegan cheeses and this article opened by eyes to far more options. Thanks so much! My pleasure! Giving up cheese is a hard one but it does get easier! Just thought I would mention I have not tasted ‘cheese’ for years, nooch is great but then…. VIOLIFE PARMESAN came to Ireland and you might not believe me but it is CHEESE! It tastes exactly like strong, tasty cheese and yes, it is VEGAN! Thanks for the tip – I need to check it out! Thank you, thank you, thank you. This post has given me hope as yesterday I was told I need to cut dairy. It’s not easy, but it’s totally doable, and there are new products out all the time to help us cope. I plan to update the post soon to include some of my faves, like Silk Almondmilk Yogurt and Kite Hill yogurt and cheeses. And Miyokos Creamery makes this cashew-based sundried-tomato garlic cheese that is SO GOOD. Best of luck – you can do it! I have to comment about your choice in store-bought vegan cheese. While everyone has their personal tastes, I found Daiya to be one of the worst choices on the market. I gravitate to Field Roast Chao Cheese. It’s a healthier version based on ingredients, it doesn’t contain a ton of preservatives, actually has natural ingredients, and melts so great on a grilled cheese sandwich. I’m not a representative of Field Roast but will forever recommend all of their products due to flavor and natural/healthy ingredients. Thanks for this page, it gives a ton of information that I’ve been looking for!! Oh I actually love Field Roast products too! I’ll have to add that to the list. Thank you Michelle! I found out that I was allergic to milk about 15 years. I have cut out dairy completely. I always thought that cheese would be hard to give up, but honestly the thing I miss most is ice cream. Sometimes I get dairy-free ice cream, but it isn’t the same. I bought some fake cheese from Trader Joe’s a couple of years ago and it was indescribable…..bad. I have heard that cashew cheese is good. In the last year I started using clarified butter; it contains neither lactose or casein. I’ve done that too; they’re delicious! Daiya Cheesecake is very good. A2 milk is the greatest. No hormones. You have a lot of good info listed. I have have a milk protein allergy and have learned that some dairy free or vegan cheeses contain milk protein in them. Do you look at this also with your recipes? Okay, that’s interesting. I’ll have to look into this! I nearly cried while reading this article! Recently I’ve had to totally cut dairy from my diet due to severe health concerns. My stomach just decided that it basically didn’t want to function…and trying to find things I’m actually able to eat hasn’t just been a nightmare, but also very emotional for me. I am SO incredibly grateful to have stumbled across this. My thanks can’t even begin to show how grateful I am for you posting this!!! Giving up dairy is HARD! But man, when I realized how much better I felt without it, it was a no-brainer. I still miss dairy sometimes but it does get easier, I promise! I’m Dairy (and gluten) intolerant but goat cheese is fine. Also, Daiya has a great cheesecake. I’ll need to try the Daiya cheesecake. Sounds delicious! Thanks for the recommendation! Eek, that is understandable! Thank you for letting me know. I will look into editing my ad settings with my network. My husband is lactose intolerant and we had thought cheese was out of his diet and did for many years. and found out that the whey dissolves from the cheese after 90 days. Hard cheeses do not have whey. whey has dissolved. Lo & behold, my husband has been enjoying hard cheeses again in his diet!!! I want to shout this out to the world & the lactose intolerant population. So few people understand this. Hope this may be helpful to you & your followers.